Junior Morias celebrates his goal for Posh against Oldham. Photo: Joe Dent/theposh.com. To paraphrase the late, great Bill Shankly, if this game had taken place in my back garden I’d have drawn the curtains after a few minutes. It was one side who just didn’t want to play against another team who wanted to play, but couldn’t. Visitors Oldham strangled the life out of the match once taking the lead with their only shot on target after 11 minutes with the most blatantly cynical slow-the-game down approach since Roberto Di Matteo bored the life out of London Road with MK Dons almost a decade ago. Posh full-back Andrew Hughes beats Oldham's Aaron Holloway in the air. Photo: Joe Dent/theposh.com. I do wonder about managers and their mindsets though. Latics boss John Sheridan spoke afterwards about a tough run of forthcoming fixtures which could determine his side’s Football League status in the next few weeks. If he’s concerned, and with Sheffield United next up he should be, why not try harder to secure three points against a team bereft of confidence and form, and without their number one centre-back and goalkeeper, and with so little to play for? After all Oldham arrived at the ABAX with just one defeat from their previous eight matches. They were the form team. Instead once Lee Erwin’s volley had provided a fine finish to Olly Banks’ precise chip, Oldham shut up shop, sat deep, took an age to take every throw-in, kept sitting down asking for physio attention and took full advantage of a compliant referee who seemed enthralled, amused even, rather than dismayed at such obvious negativity. Posh dominated possession before the break, but were too ponderous going forward. They were ragged and scrappy in the second-half and yet found an equaliser 17 minutes from time when substitutes Marcus Maddison and Junior Morias combined to great effect with the latter heading home the former’s precise cross. Posh boss Grant McCann watching the Oldham game. Photo: Joe Dent/theposh.com. The goal woke Oldham up and another paltry ABAX crowd were treated to a low-class, end-to-end contest for the final 15 minutes. Temitope Obadeyi immediately strode through and missed for the visitors, Posh midfielder Anthony Grant delivered a brilliant block to thwart Aiden O’Neill, while Morias missed the chance to seal a first three points for his team in five attempts after a terrific through ball from Maddison to Craig Mackail-Smith. Mackail-Smith stumbled and fluffed his chance to score, but still had the presence of mind to tee-up his strike partner whose sidefoot rolled the wrong side of a post. A draw was about right though as because neither side deserved to win. Posh were never going to receive the attacking space they found at Chesterfield in their previous outing against an Oldham side who have conceded remarkably few goals for a team who might yet still go down. Paul Taylor looked the most likely source of a Posh breakthrough, although his end product disappeared (as he did with an injury at half-time) once a superb fourth-minute pass had been accepted in stride by Michael Smith who forced a fine early save from highly-rated Oldham ‘keeper Connor Ripley. Craig Mackail-Smith in action for Posh against Oldham. Photo: Joe Dent/theposh.com. Ripley also smuggled a Mackail-Smith shot behind and watched as Andrew Hughes, Michael Bostwick and Tom Nichols missed presentable opportunities from set-pieces. 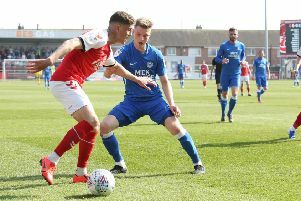 Ripley was a spectator in the second-half with only Morias managing to hit the target once he had added energy and passion to the Posh side by replacing Tom Nichols. Posh boss Grant McCann accused his players of going through the motions before the break. Posh man-of-the-match Michael Smith insisted the players rather than McCann should take the blame for a collapse in form in 2017 which has seen 15 points taken from a possible 48 - he can say that in the sure knowledge few players have been sacked for poor performance. The Posh fans have understandably become irritated and frustrated, but the heckling of both Maddison and Morias before they’d even entered the field of play even managed to annoy the club’s mild-mannered press officer. It’s self-defeating and rather embarrassing. In contrast Oldham’s 322 travelling fans were loud, supportive and generally excellent, although self-amusement is probably a necessity if that’s the brand of football their team serve up every game. Posh: Mark Tyler, Michael Smith, Andrew Hughes (sub Jerome Binnom-Williams, 65 mins), Jack Baldwin, Michael Bostwick, Anthony Grant, Chris Forrester, Brad Inman, Paul Taylor (sub Marcus Maddison, 46 mins), Craig Mackail-Smith, Tom Nichols (sub Junior Morias, 60 mins). Unused substitutes: Harry Anderson, Leo Da Silva Lopes, Luke McGee, Morgan Penfold. Oldham: Connor Ripley, Brian Wilson, Anthony Gerrard (Sub Jamie Reckord, 82 mins), Peter Clarke, Aiden O’Neill, Paul Green, Chris Taylor, Ollie Banks, Ryan McLaughlin, Aaron Holloway (sub Temitope Odadeyi, 65 mins), Lee Erwin (sub Michael Ngoo, 83 mins). Unused substitutes: Ryan Flynn, Josh Law, Ousmane Fane, Chris Kettings. Goals: Posh - Morias (73 mins). Oldham - Erwin (11 mins). Cautions: Posh - Baldwin (foul), Morias (foul), Binnom-Williams (foul).